Improved weather conditions has resulted in some progress at the High Pastures site. We have now positively identified the edge of the filled entrance shaft and recovered a few more finds. Read on for details of progress at the site. Two days of improved weather conditions on the 14th and 15th April have allowed some steady progress at the High Pastures site. Excavation has continued in Trench 2, where one edge of the backfill of the former entrance into Bone Passage has been identified. And, although artefacts are fairly sparse within this fill material, we have recovered more finds. The image above shows George Kozikowski and volunteer Geoff Stephenson excavating in the NW corner of Trench 2, removing context C205. We have now positively identified one edge of the backfilled original entrance into Bone Passage. In the images that follow you will see that we have cleaned down the SE sector of the trench onto a buff-coloured sediment that is rich in charcoal fragments and burnt bone. This gives way to the dark, organic rich sediment that comprises the fill of the entrance shaft at this level. The sediment contains charcoal, burnt bone fragments and significant quantities of fire-cracked stone. 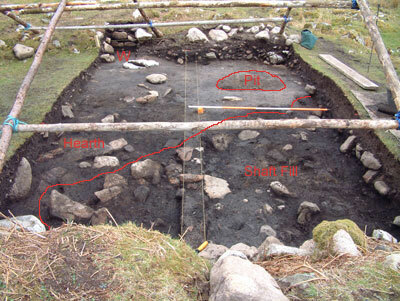 At the inter-face between the buff sediment and the fill of the shaft we uncovered slabs of rock that are all tilting at similar angles into the backfilled entrance. These may have been paving slabs that had been built over the filled-in shaft. When the fill of the shaft started to subside, possibly caused by voids lower down in the fill, then the paving also gave way and came to rest at these angles. We should be able to confirm this possible interpretation of these slabs as soon as we have excavated more fill out of the shaft. entrance. In the dark fill of the shaft in the foreground of the image, we have also uncovered several small holes that are descending vertically. These voids suggest we may be getting closer to the boulder fill of the shaft onto which this darker material was subsequently deposited. While the excavations continued in the main sector of Trench 2, we also investigated the tumbled granite wall at the SE end of the trench (see W on image below). 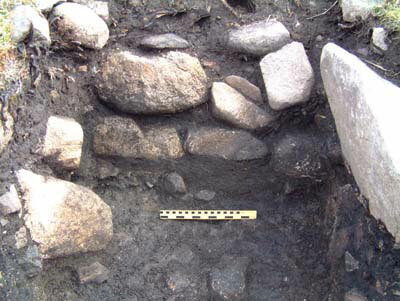 This 1 metre square extension of Trench 2 has allowed us to uncover the front face of a well-built wall, comprising granite boulders and cobbles. The wall still stands to a maximum of 3 courses high and rests on a fairly clean soil, possibly indicating a period of abandonment of the High Pastures site before the wall was built (the soil sits directly on a compacted layer of fire-cracked stone in a buff-coloured sediment). 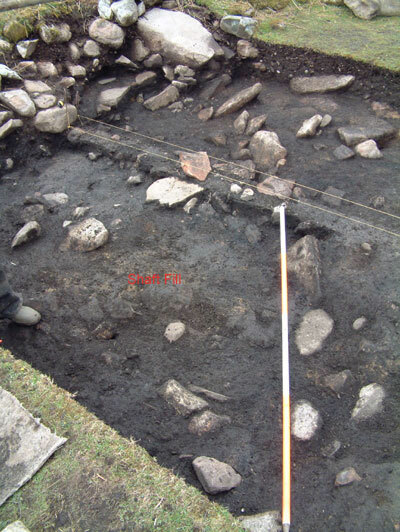 The trench investigating this feature will have to be extended so we can hopefully pick up the back edge of the wall. This will enable us to measure the overall thickness of the wall and its relationship to the archaeology beyond the U-shaped structure. 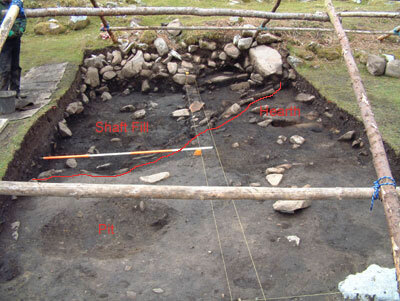 Of particular interest is the fact that the small section of wall uncovered seems to be quite straight (most prehistoric structures from the Iron Age in this region are generally round in plan). We hope to continue with the excavation of Trench 2 over the next week, taking out the next layers of archaeology from the former entrance into Bone Passage. However, we still have some way to go. After taking levels on the surface of the fill we have just uncovered in Trench 2, we have calculated that we have between 1.8 and 2 metres of material to remove before we enter Bone Passage! Visit the site soon to see what we find. The excitement must be growing! Your painstaking work is paying off! There sounds like aconsiderable amount of fill needs to be moved first before access can be made. 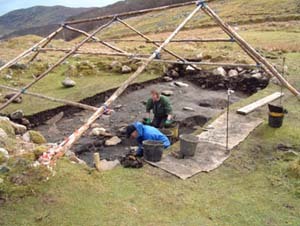 We cannot wait to join you all again but at the moment are knee deep in the landscape essay associated with the Strath. I am trying to remember Steven’s words that ‘the desk top work must be done as well’. I can just imagine the scene! Martin will be recording meticulously, George longing to leave his detox behind whilst Steven will be working through the night. Is there any news since 17th April? I keep anxiously checking the weather forecast for you.